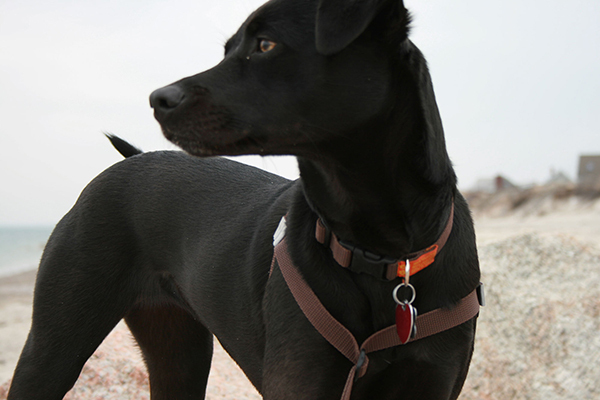 The Original front-leading dog harness is our basic (Not-So-Basic!) dog harness. It is made of durable and strong Polypropylene webbing and comes in a rainbow of colors... including Rainbow. Like all our dog harnesses, it has Dog/Human Friendly Engineering so it is easy to use, comfortable and light-on-your-dog. Includes 3M Scotchlite Reflective Material™ for safety. The durability and strength of Polypro webbing in your choice of colors. Comfortable and light-on-your-dog. Includes 3M Scotchlite reflective material. I've bought 3 or 4 of your harnesses and love them. Love, love, love these harnesses! And most importantly so do my two puppinos! I recently ordered a harness with the add on matching leash. Great company and amazing customer support! I recommend them to everyone I see with a dog. I purchased your harness and it has made a big difference with a pulling dog. He is a rescue and very very friendly. I just wanted to let you know how delighted I am with the dog harness I recently bought from you. The best I have ever bought, it really does work. My dog walks happily beside me now instead of pulling me along. I wish I had had this for my previous dogs. I will definitely be recommending this to other people. Also impressed with how quickly it arrived. Thank you very much. Love your dog harness, second one we bought. I got this harness for our Golden Retriever and it is the best. In the past we had to get her to "step " into other harness but no more! It is secure, easy to use and makes long walks more enjoyable for all! Thanks for a great American made product. Just had to tell you how pleased I am with this product. I heard your ad on the Howard Stern show. This is by far the best harness/leash I’ve ever used. I have a King Charles Cavalier and have used a neck collar for his first 2.5 years. Your product does everything you advertised that it would. Great job with manufacturing this collar, it truly has been great. We go on longer walks now since I’m comfortable with this fine harness. I got the harness on and it’s perfect and works great. This harness is truly nothing short of a miracle. I was so impressed by it when using it for my 84 pound Golden Retriever that I purchased one for my parents to use on their dog who can pull like crazy. My dad is 94 and had mentioned he was having a knee issue and the dog had almost pulled him down a few times. Given the success I had with it for my 84 pound Golden, I knew it would work well for my folks. When he finished the walk, he was very impressed. We both were! So let me start this off by saying I ordered your collar and a leash for my dog who is a Shi poo. After receiving it the other day I took my dog for a walk. My dog, although small, was a real puller. Your leash worked. It actually worked. Can't tell you how much better the walk was. Received harness. Put on 7 month old GP/Anatolian pup. Like different dog! No pulling, no side trips. Almost perfect heel position. Made believer out of this skeptic. I absolutely love this harness and so does my dog. We got the Original harness when he was a puppy, he was having issues with pulling while on his leash. Once we used this harness the first time we knew it was much better than any we had tried before. He stopped pulling and taking him for walks was a lot more comfortable for us and him! This company is amazing and they stand by their product 100%, dealing with them is always a pleasure. We just ordered our third harness from them because my dog got sprayed by a skunk. They were super helpful and even provided us a discount. I cannot recommend this company and their harness enough! Definitely worth every penny! Twee jaar geleden kwam Credo bij ons wonen. Een kooikerhondje van 9 maanden oud, dat een nieuwe thuis zocht.Wij hebben hem geadopteerd en hij had toen zo een harnasje. Het is een super handig en goed voor de hond te dragen. Na 20 jaar honden houden eindelijk iets SUPERGOED. Nu hebben we een nieuwe kooikerhond en van daar onze bestellingbij jullie. Hartelijk dank voorde service , de vlugge reacties en de opvolging. Two years ago, Credo came to live with us. He was a 9 month old Kooikerhondje that looking for a new home. We adopted him and he came with one of your harnesses. It is super convenient to use and gentle on the dog. After owning dogs for 20 years it was nice to finally find something SUPER GOOD. Now we have a new Kooikerhondje and have placed our order with you. Thank you very much for your fast service. My 85 lb dog is horrible to walk without it! You guys are the best! I’ve sent several of my friends your way because these harnesses really work and you gave the best customer service! These are amazing!! Went from a dog sled type walk to controlled peaceful stroll with my 2 dogs and it happened on the first walk. HELLO! my dog and I love your great invention! I have a very strong American pit bull, when I put it on him he gave us a look like, "what is going on here?" thanks again! I bought the original walk your dog with love harness for my dog Max several months ago, WoW what a difference. Much easier to walk him. When he had just the collar he would on occasion pull out of his collar. It is no longer a problem. It is so much easier walking. I received the harness 2 days ago and can’t believe the difference it has made! Our lab mix Duff has a lot of energy and used to pull on the leash. He would choke and at 70 lbs he was really starting to hurt my arm! He would also go crazy when he knew he was going for a walk, making it difficult for me to get the leash on him. The first time I put the harness on him he immediately calmed down and walking him is now a pleasure. I highly recommend! The results have been outstanding. I have 2 miniature schnauzers 9 & 8 years, the younger being a new addition and a puller. My older dog Zander is good on the leash with occasional melt downs. I tried him in his harness first and it was an immediate look of being comfortable after having a neck collar all these years. Zero, my new addition came from a home with a privacy fence and no walking so he reacts to everything. He was at first somewhat bummed that his party was over but the difference in just under a week is amazing. Every time he turns and responds, I can hardly believe what I'm seeing. Instead of being in a frenzy to get to everything, he's slowing down, and looking much more relaxed and happy. And I sure feel more comfortable in my arms & shoulders. Recommended this harness, as I have a Blue Healer pup , who was pulling on another harnesses. But this one- wow! I am very pleased with this harness on my 78 pound Airedale. 100% better than the choker I had been using. Walks are so much better!! We rescued a great pup, but walking him was a nightmare. He pulled so much we were afraid he was doing real damage to his neck, nervermind what it was doing to us-- like getting pulled by a sled dog! We purchased the original Walk Your Dog With Love harness which we were thrilled with, especially after purchasing THREE other different brand expensive harnesses that not only didn't work, but were extremely difficult to get on the dog. When we found the Walk Your Dog With Love harnesss, we thought it was too good to be true. Finally, a harness that not only worked, but was so easy to get on and off too! One click! What a difference in our lives this harness has made. Walking our dog used to be such a challenge for us, and for our beloved pup. Not anymore! Having this harness has been a real game changer, and it's reasonably priced too! We have just ordered another, the NEO with the leash built in. Can't wait for it to arrive! We have no doubt we are going to love it just as much as the original, and our pup will too. These harnesses WORK! Thank you making such a great product! LOVE IT! I was so skeptical that this was too expensive, and I was prepared to return it. After just 1 walk, I was won over. It really works! Thank You from Pip and me. I am completely blown away how great this worked. I have 2 dogs who walk great separately but together are impossible. Put on the harnesses and they have not pulled since. Got the harnesses today and the dogs passed the "talking to the neighbor while a cat walks by" test. The harnesses are wonderful. Thank you! We struggled for the first year with our Chocolate Lab really pulling us about on walks. I saw your lead on the internet, ordered it and tried it out. Its been incredible, a complete change in his behaviour. So thank you, your product really has made a difference. I love this product, swear by this product and tell all my friends about this product. I think my dog feels the same way too! I received the harness a few days ago...and I am AMAZED!!! No sled dog behavior trying to PULL me everywhere. Every time she even tries, it's a gentle reminder that the lead is in front of her, and immediately slows her down. For the first time in a year, it's a JOY to walk her outside. This is a GREAT HARNESS!!! 5 STAR!!! Do yourself and your dog a favor and buy a walking harness. I bought the Original which performed way beyond any expectations I may have had. My new rescue dog who obviously had horrible walking experiences in the past became a calm and enjoyable walking companion wearing the Walk Your Dog with Love harness. Get one ! This lead has change my life - amazing - telling everyone on my dog walk. I am walking my dog with love now. We have two and these are the best. This harness changed my dogs world and saved my back. Best purchase I ever made for my huskies. I bought my first one over 5 years ago and have recommended to every adopter I interviewed. The best harness, make a big difference. l have a lab and 3 Pitbull mixes !!! Really great product, tried and worked well. Thank you so much for this product! Your product and service is fantastic! I ordered one for my puppy a year ago and ordered the next size up and you charged only half price...what a happy surprise! I also ordered one for our other dog too. They are big dogs and this harness is just wonderful. Thank you again! WOW! I got my harness yesterday for my 5 month old Rhodesian Ridgeback and OMG - it's like I have a completely different dog, I was actually smiling as I walked down the road with her. Rather than wrestling her pulling as we walk down "Chicken-bone Alley" - lots of chicken shops in Hackney (London), I breezed down the road, proud of my well behaved pup! It's hard to find front fastening harnesses in the UK, but this was well worth the search and I'll definitely be getting the next size up when she's fully grown. Walking has become a pleasure again for both my and my dog, she is infinitely happier and so are my arms/shoulders! I have this and it has helped! We found these to be extremely helpful in controlling our two pups on walks! We tried all sorts of harnesses for our Alfie who just did not take to walking on the lead. Without a doubt, the "Walk your Dog with Love" harness has been the best we have used. He doesn't pull at all now, and is happy to trot alongside us when out walking. It is so easy to put on and take off. Simply slip it over his head, pass the strap under his chest and clip it up, job done, unlike some that you need a degree in origami to fathom out. I just bought my second harness from you and I love it. Thought I would treat my dog to a new one for his birthday. He is a Beagle-Jack Russell and he loves his walks. This harness does all it was hyped up to do. Our feisty leash pulling Husky has been much easier to walk now that she used the Walk Your Dog with Love harness. They stick by their guarantee. I will continue to use the Walk your dog with love products. Fantastic dog harness, that is super strong and robust, and really stops even the strongest dog from pulling and choking itself. Used on both my Golden Retrievers, easy to put on the most excited dogs before a walk. Plus the customer service is fantastic. Top recommendation for any dog owner! I purchased a harness this Christmas for my "granddog" who is over 80 lbs. and full of energy. My daughter would not walk the dog because there was so much pulling, even with a regular harness. My daughter would end up exhausted and the dog would end up panting and choking. I was determined that this big, lovable dog would walk properly, as both the dog and m daughter needed the exercise! My daughter used the new Walk Your Dog With Love harness I had purchased. What a wonderful experience they had! They walked for over an hour with no pulling, and both had a good night's sleep that day. Thank you for such a wonderful solution to a very common and frustrating problem. I can't wait until I dog sit and can walk the dog myself. Not only did I order the super red leash to match my little Zara’s harness, but I ordered her a matching collar and also one for my other dog Lola. I am very appreciative of your help and customer service. I live in a very tight-knit community of dog-loving people and will most certainly pass your information along. I don't usually review, but since I love dogs i will. I have a 75 lb Greyhound Shepherd mix who would pull when walking. Not anymore. I love it. Love the harness. My arms didn't hurt after our walk. No problem walking 2 dogs at the same time. Being 75 and disabled i have a job to walk at a certain speed But taking my 11 month Cavapoo for a walk has made life so much easier with his harness He doesn't pull any more And when i stop he stops Brilliant whoever designed it you are a genius. 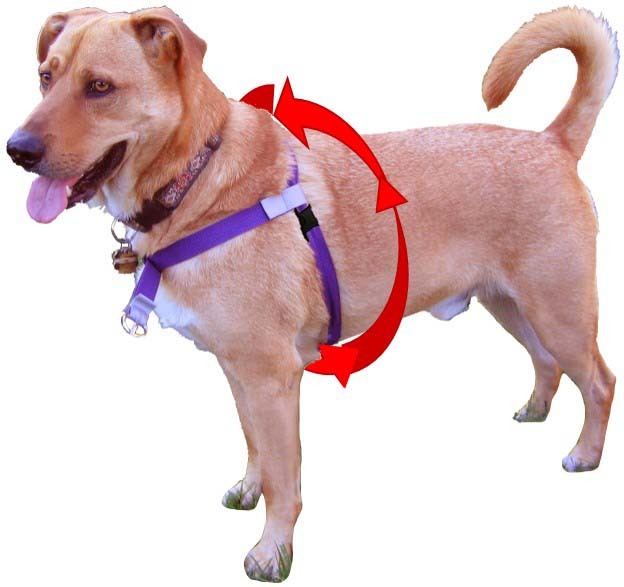 I used this front attaching harness on my last two dogs. Works like a charm. I bought these harnesses for both my Bernese mountain dogs! We have tried everything, collars, martingale collars, regular harness, front clip harnesses, dog training, etc. Our dogs still would pull us on our walks and walking them was not enjoyable. It’s in their nature to pull after all that was what they were bred for. These harnesses have been a miracle. Our dogs no longer drag us on our walks, I enjoy walking them and they respond to my tiny taps on the lead when changing direction. They still pull when they see a bunny or pick up on a scent but it’s much more controllable. I’m a believer and highly recommend for others with the same struggle. Works on small dogs too. Stopped my 18 lb Pekingese from pulling & the other behaviors that i see in your video. It makes our walks much more enjoyable for both of us. I use walk your dog with love harnesses everyday in group classes, private lessons and with rescue work. Fabulous products, seriously!! I bought one of your harnesses several years ago at a dog expo in Timonium Maryland. I absolutely love it and want to buy another! We really love it - it works like magic, our walks are so much more fun now! What a great harness. No choke is the most important. Their trachea can't take the pulling. We purchased a Walk Your Dog With Love harness and we are loving it. Thinking of getting another for backup. I can’t recommend this product with enough enthusiasm! My 4 year old, 80 pound lab has always been a puller on leash, and I’ve tried SO many other harnesses and leashes to try to correct this. This is the only harness that has worked and I couldn’t be happier about the purchase. I will definitely be buying another for my other dog. Absolutely satisfied! My name is Halo the dog. Don’t allow your parents to buy this leash. You will never be allowed to drag him/her down the road again. You won’t be allowed to chase squirrels or pee on the neighbors mailbox post. It’s awful!!!! Bought one for my dog Forrest who was always pulling and jumping. A week later he now stays at my side. I had a similar one and they would always fight it. Just ordered one for my other dog and 2 car restraints as well. I have to tell you. We have a 100 lb lab that used to drag me down the road. I’ve tried several leashes and YOURS is the only one that works. Thank you so much!! Really thrilled with this harness. I have rheumatoid arthritis and taking Ellie (our 11 month old Cockapoo) for walks was getting harder and more painful on my back as she is a puller. The difference on the first use of this harness was nothing short of remarkable as the pulling stopped immediately and now walks are a pleasure. Wish I had ordered one sooner. Thank you so much for sending my new harness so fast! I was able to walk my dog Layla today without her trying to run away. I will tell all my dog loving friends about your great customer service. This makes walking our 120 lb Lab and our 65 lb Lab a pleasure! Love the front lead!! Works great with my Boxer puppy! I absolutely love this harness, totally takes care of our young golden retriever. Best harness I've been able to find anywhere!! We have a 6 mo old Cavalier King Charles Spaniel puppy that we’ve been trying to leash-train for 4.5 of her 6 months. She’s very energetic, super cute (and knows it), and very willful. She learns verbal commands rather easily but has been a terror on the leash since day one. We had our 1st walk in her new WYDWL harness today and the difference is almost unbelievable. She’s still very energetic, but quickly realized she’d have a better time if she walked along with me until I gave her a “break” command. The walk was a breeze, and I can now look forward to them with pleasant anticipation instead of dread. More fun for our puppy, too! GREAT PRODUCT. I've got a "Walk your dog with Love" harness for my dog, best harness I've ever seen. My English Golden pulled like she was in the Iditarod. She needed this harness to understand what the walk was all about. Now she heels with no leash. My son's dog is a puller. Put this harness on him and he was perfect before we got to the end of the driveway. Great harness! Fits better than some others on the market too. We now have a harness for both of our dogs and it has made a tremendous difference in our walks. I now walk them instead of them walking me! After Soph pulled so hard on our old leash my husband had to have hand surgery, we decided enough was enough. We bought the no pull harness with matching leash and are so happy. We think Soph is happier too because she no longer uses all her energy clawing her way down the trail. We would highly recommend this harness. This is a great harness and I highly recommend it. My son's beagle would pull and strain and it was awful walking her. I got her the harness and right away I was in control and walking Lola was sooo much better. I got one for my Golden Retriever, Summer, as well! Great product! It really saves your shoulder! I have this harness...no training, no adjustment period for the dog...I put it on him and walked without him pulling...best thing I ever purchased for my crazy wild child doggy...thanks for an incredible product! My dog is 48lbs with long legs and lanky body...and found his fit by weight. I never would have believed it fully until I experienced it with my own eyes when I was walking my 90lb American Bull Dog. Wow! It worked from the first try. This is an amazing product. My 110 pound GSD was always pulling so hard that he gave me a tennis elbow! Since using this product, he walks nicely at my side. It has made our walks a pleasure!! I Just ordered my second harness, somehow left the first behind while on vacation. The harness make a WORLD of difference walking my GSP! My back is killing me right now, can't wait for the new harness to arrive!!!! I have these and the dogs are good in them. 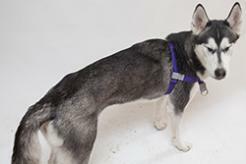 Sandy is a 40# mixed breed--husky, keeshond, and who knows what else. She's a docile, mellow dog--until she goes for walks. Then, she's hell on wheels! Your dog harness really works great. She doesn't yank or pull. We just got ours yesterday and it made an instantaneous difference in walking our dog Gypsy!! She loves it and already gets excited when it comes out of the cupboard! When we got him, our rescue had been trapped as a feral dog and would need to be introduced to a new way of life. At our meeting Shallbe reacted to the animal control slip lead around his neck about the same as you'd expect if he was a wild coyote. With our Walk Your Dog With Love harness we take Shallbe on at least 8 separate walks a day so that's how many times his harness is going on and off. The latch and all parts are still working great. This harness has held up to some VERY determined escape attempts in the beginning and it is what we have used exclusively for all of Shallbe's obedience training. Thank you for a great product. I have been using a choker collar for years. This Harness is by far the best harness out there. I just give a little tug and my 75 pound lab stays with me! I have two of these for my Westies. I bought them 4 years ago. I was also able to order matching collars. They still look and work great. I throw them in the washing machine when needed and they look and smell great. Thanks for a great product! Just received my first harness and leash. Wow! Love it! Looking at another for my small, very wild dog. Just got my second harness and lead. Walking both dogs together beautifully now. The difference is amazing. The dogs just seem to know it and want to be lead! This harness is AMAZING. From the moment I opened the garage door to begin our always dreaded walks, something unbelievable happened. Instead of the usual pulling to the point of wheezing and choking himself (to the point of my concern for potential damage to his windpipe), he immediately walked calmly next to me. I actually said aloud, “Who IS this dog and what did you do with my Henry”?! I simply - key word, simply - put the harness on and began walking, no training, starts and stops or frustrations for either of us. I don’t know how you finally got into his adorable little head, but it was truly a miracle. THANK YOU, thank you, thank you. My walks with Henry, a 20 lb TToodle (Tibetan Terrier/poodle), are now drama-free and enjoyable after almost a year of trying and failing. This is my second harness for my 70 pound Vizsla -who is not slowing down with age. It works better than anything I have tried to counter his pulling. I've been walking my dog (7 year old English Springer Spaniel) on WYDWL harness for the last 4 years (I think!). It made such as difference as my dog and I could finally go on walks together without me being pulled over and without the need for him to have face restraints that made the walk stressful and upsetting for us both. I have a Mini Schnauzer who always wanted to be leader of the pack even after obedience training and much practice. It took about three days for her to walk with me without putting some pressure on the lead. Now, as we near a turn/intersection she will slowdown and watch me to see which way we’re going. We both enjoy our walks so much more. Awesome harness. Love walking Hazel now. Thanks! This is THE best. Recommend it to every dog owner I see. Wish I had free samples to hand out! 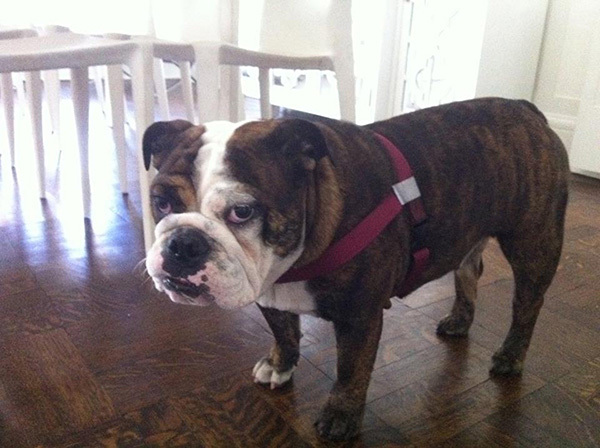 The Walk Your Dog With Love harness has changed our walks with our Olde English Bulldoggie! We had tried numerous harness varieties as well as choker chain collar and the collar that pokes into the dogs neck if he pulls. Nothing worked well. 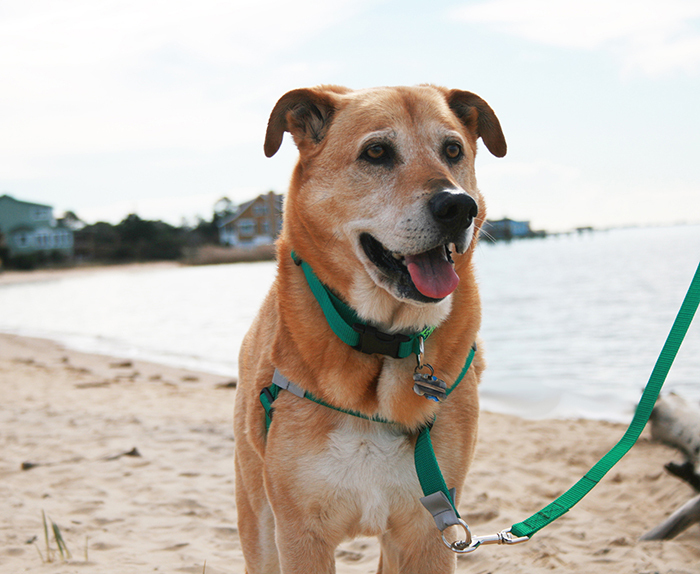 This harness is like magic and our strong guy walks right by our side, every single time! I have this harness for my English lab who is a puller & she walks really good w/ it on -- a different 🐶 dog -- I highly recommend it! Hi, I'm Oliver and am a Newfie. My mommy promised she would never give up on me (I've been a handful from the get-go) and she hasn't. I thank my lucky paws. The big truck was coming weekly with packages addressed to me. Each time I got so excited I drooled all over the place. Then when mommy opened the boxes I became sad. Just another collar, harness, or walking aid of some kind, but, occasionally it was a box of treats and toys from Chewy. My mommy swore she would never buy another walking device EVER! The only thing that made her feel a tad better is that she was able to donate the zillion she had given up on. Then....one day, she saw the advertising from "Walk Your Dog With Love, and once again said "this is LAST time EVER!!! It actually was her last time, even though I was as stubborn as could be and she gave up on it within a week or two. Then, just today, she sat me down and said "Oliver, I love you more than life and I always will, but I'm feeling a little sad. All I've wanted since the day we got you was go on walks, take rides to the park, and have you in the car with me whenever possible". I knew she was sad because eyes were leaking again. I'm know almost 1.5 years old, and I've been working with a private trainer and I'm slowly catching on. Remember I am a Newfoundland and most of us are slow, lazy and STUBBORN! Just about an hour ago she approached me with the last walking device she ever bought and I knew what I had to do. Mommy put on my harness that has been put away for 6 months and I was a true gentleman. I cooperated and when she nervously took me outside I didn't make her trip or fall down!!! She smothered me with hugs and kisses and we were both so excited and happy that I dribbled. She said she almost did too. I'm writing to you to thank you for making THE WORLDS BEST DOG HARNESS ever!!!! It is the last one she ever bought and the only one she didn't donate. Maybe now she'll stop calling me her "Hairy Monster". We have just received our two dog harnesses and we love them! I use the harness on my well-trained dog, but could NOT work with shelter dogs without it. I use it with a short lead for leverage. This is a GREAT product! It really works! The last Original harness we purchased was well worth the price and lasted 9+ years. We previously purchased one of these harnesses for our American Bull Dog / Bull Dog Mix. It was a life saver. This harness is the best for control and comfort! I have tried every kind of harness and leash system on the market, from Wacky Walk r to you name it. Nothing helped my dogs to stop pulling. I even took them to training. This harness instantly stopped my dogs from pulling and tugging! I could not believe it! Very rarely have I found products that actually meet and exceed what they say they do. This product met and exceeded my expectations and is amazing and I would recommend it to anyone that has stress, anxiety and frustrations with their dog pulling on a walk. Bought one many years back at a county fair. It worked as soon as I put it on my dog. Amazing. Unfortunately, it got smelly after awhile. I just ordered another this morning. Decided to give it another try because I know that this harness works. Can't wait to start enjoying walks again. Just got mine last week and my baby girl and i both love it. She really responds well now. I was advised to check out your harnesses by friends of ours who knew of our pulling struggles with our lab. Whilst apprehensive about ordering from the UK, I decided it was worth a punt to stop her pulling so bad. The harness arrived no more than 8 days later! I am so impressed by how my darling girl no longer pulls on our walks. It is such a simple yet incredibly effective system! Now whenever we are out and we meet a dog I tell the owners all about you and you're fabulous harnesses! I am such a fan and advocate of your harnesses now it's honestly the best £30 I've ever spent! Thank you so much!!!! Thank you for introducing me to the dog harness. It took several tries to adjust it properly on my 85# German Shepherd and to get her used to it. She loves it now and won't let my husband put anything else on her (like the cruel choke chain the Rescue said we must use for her). Being a strong girl, she does not pull like she used to now and with my working with her and giving her the love and attention she needs (this being her fourth home). She now trusts me and I have more confidence as her leader when walking her. Thank you once again. We recently purchased two of your harnesses for our 70 lb. dogs. Hurricane Harvey hit and I had to be rescued by boat with the dogs who were wearing them. I could not have done this without those harnesses. Thank you. Just got your harness and leash in the mailbox. Watched your videos. Put it on my dog, Baylee, and out we went. She behaved like an angel. NO pulling, running, crouching and barking... I am so happy. I actually enjoyed walking her... Thank you. Thank you. Thank you. Thank you for creating this. Thanks so much for your products! Our newly adopted 3 yr old pit bull is being transformed with this dog harness. We all love it! These things really work. We walked our dog for eight years, everyday fighting and struggling with him. Not anymore!! Thank you so much for the prompt and efficient way my problem was dealt with. These days you rarely get a reply to emails let alone such good after sales service. My daughter was so pleased that I was able to get her dog a harness as well. I will recommend your company to friends and family. Thank you again. My dog loves this harness, Great product!!! 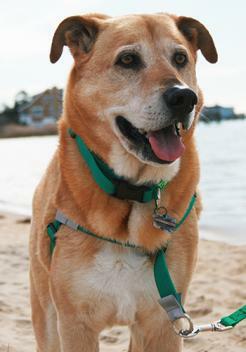 Our obedience trainer recommended your harness & hands out your card to all her clients. Our previous Sheltie was a Houdini when it came to conventional collars & we had to resort to a choke chain to control his flight risk. We’re happy that your harness offers a superior alternative, and we can see a significant difference to a conventional harness or collar when walking our Sheltie puppy. He’s not a puller, but he stays at our side more these days. We have been walking our dog, Coco, for the past week using her new dog harness. The changes in her walking behaviour are nothing short of miraculous! Most of the dogs from other testimonials on your website were dogs who pulled ahead on their leash. Our dog never pulled ahead, but was what I call a "reluctant walker". She would stay behind and sniff every blade of grass. Some days, you felt as if you were almost having to drag her around the block on her walks. With her new harness, she walks smartly alongside us. Such a change! I have a 2 year old French bulldog that loves to pull, however I'm am finding that it is causing issues with her acid reflux, so off went the collar and on went the search for a dog harness that fits little "Fat Chance" correctly. I have tried many and finally gave up and made my own makeshift harness in the meantime. This is THE BEST thing ever! I can walk my pulling machine w/ my pinky now!! 🐶❤️🐶❤️🐶❤️🐶❤️ Great dog harness!! Wow! I just got my dog harness and leash and after a few minor adjustments (great video, BTW) it fits my guy perfectly. Just walked him around the house a bit with it, but already there's a huge difference. He's a feisty little Min Pin mix with a pull that makes me suspect he's crossed with a Clydesdale, but in your harness he walks just as calmly as a lamb. I couldn't be happier! Just purchased this dog harness for our 4 yr old Terrier "puppy". He seems to be more behaved during his walks - so far so good. Thank you. My dogs and I are so pleased with them that I've just promoted your dog harnesses on my Facebook page. Now the winter of our discontent is made glorious summer by the sun of 'walkyourdogwithlove.com'! I rec'd the new dog harness on Saturday. What a tremendous difference it made. The material used is so much stronger. I didn't realize how big her chest is, and her girth is bigger than other Pits. This harness when adjusted stay's in place and nothing moves. She is comfortable with it on and there is no chaffing at all. My husband said their walk was so much easier. He really felt in control, there is no way she can get out of this harness even if the Pit she doesn't like walks right in front of her. Thank you again, peace of mind is so important when walking a dog as strong as mine. Want to say that I love the dog harness. It is very easy to put on and my dog is not bothered by it at all. And the leash is great. Thank you so much for inventing this dog harness. I have a Lab-Hound-Pit Bull mix who loves to pull, run and lunge towards any animal it sees or smells. To say the least, walking her has not been a pleasant experience since we got her three years ago. We have tried all kinds of harnesses and leashes and have had very little success. The most popular ones are up around the neck and throat, but Stella still pulls and strangles herself with these. Now, with this new harness- I have complete control over her and where she can and cannot go. She still pulls some but I still have control over her and that is so key to me. She is a big and strong dog and I am a shorter person, so for me to feel confident and in control of the walk, makes walking my dog a much more pleasant experience. I would recommend this product to anyone else having issues walking their dogs due to pulling. I feel so much better and actually want to get out there to walk her now! Love buying from another USA company! Your dog harness works so great we got one for our other dog. I didn't think she pulled till our other dog stopped! I ordered the dog harness for my grand dog in NY. It works perfectly. I've told several people about the harness. Stopped Spencer in his tracks, and he was starting to hurt my shoulder when I visit him in NY. I am so pleased with the dog harnesses I bought for our dogs. Walking with 2 dogs pulling was never an easy thing and while I was hopeful, I was skeptical. The change was instant! I love walking the dogs now!!! Now I'm off to buy the Zen Walking Belt! I love this dog harness for my dog. Works great. My dog weight: 78 lbs. I have these dog harnesses for two of my dogs and they work amazing. I've bought 3 total harnesses for various dogs and LOVE them! We got a new one is for smaller guests that come to our house. Glad you've expanded and happy for your success. I recently purchased a dog harness for my Golden Retriever and used it for the first time yesterday. Immediate results; no pulling. I am amazed. Thank you so much! Thank you so much for your quick service. Not only do you make the Best Dog Harness, you have the Best Service. Love all your products! The dog harness saved my shoulder and Jesse walks a "Happy walk"
I have this dog harness and like it a lot. What prompt service! We have a hyper Bichon, who has caused me to fall. From the moment we put the dog harness on, he did not attempt to pull. Amazing! I just wanted to let you know how much my dog harness has changed our walks. I have a 7 1/2 month old Chocolate Lab and she weighs around 60 lbs. Our walks were just a pulling game for her before and teaching her to walk beside me was impossible. Not anymore and I thank you so much and am very glad I found your product. I will soon be ordering the car leash. Thank you for making such an awesome product. I had my doubts as to whether yet another promise by another leash/collar/harness was going to help me leash walk my "puller" but your product absolutely came through. My very strong, 2 year old, 100 lb GSD was so easy to walk with this dog harness. I took her to a huge outdoor event with hundreds of dogs and even more people, and I had full control. People came up to us afterwards and wanted to meet my amazing well-behaved dog. A moment of pride for us! I can now take her anywhere with confidence. Thank you! I am in a state of continual amazement from the very first time I used your dog harness with our frantic sled dog dressed in Bichon's clothing. He's now so docile on the leash, I keep wondering if he's been replaced. We both have a relaxed time when on a walk. Not only that, but our Cavachon who has always had good leash manners (except in the presence of another dog) is now, by comparison, the one who pulls on the leash. Just got back from my first walk with your dog harness. Wow!!! 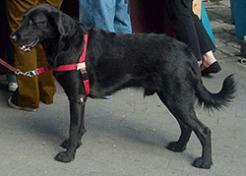 Roxy, my lab mix was always a puller. With 5 minutes, voila no pulling. This is an amazing product. Thank you so much. I purchased your dog harness for my dog Rookie over the summer. We loved it until he chewed it. It works so well and I've recommended it to many people at the dog park. I really appreciate your quick response and will be sure to recommend your company to everyone. Thank you so much. Love/love this harness! My 6 year old Cocker Spaniel was a chore to walk as she pulled and pulled no matter what magic new dog harness or collar I tried. We just came back from our 1st walk with your harness and it was 180 degrees different!! The proof is in her eyes -- they are not blood shot from her pulling so hard and my back doesn't hurt. I just ordered two more for my other two Cocker Spaniels plus a Zen belt. THANK YOU!!!!!!! What a difference these make. As a side note my mom who is now 92 was able to walk her until about 3 years ago because Bailey never pulled with the harness on. I marked the inside of the reflective tape as Left or Right and my mom had no trouble with it. Best harness ever! Thank you so much for all your help. You have exceeded all of my expectations! I will continue to promote and share my experience with the harnesses and with your excellent customer service. I bought the Original harness and a lead from you for my Springer Spaniel last week. After 3 years of training not to pull, it's the first time I have had enjoyable walks without pulling. She is 3 years old and we have never been able to enjoy a walk with her, as she would just drag us around, even though we have tried many gadgets on the market. Within 20 minutes of having her in your dog harness, she is walking like a 'normal' dog. I say normal as she has recently been assessed to having Autism, so life is quite confusing for her. Wearing a collar caused her to pull and half choke herself , it was very stressful for her and she would regularly snarl at people and passing dogs. Her mood is far better since using your harness and today, she actually went up to another dog whilst out on a walk and 'sniffed'. We are thrilled with this change in behaviour with her. She will never act as other dogs do, but she is a happier dog walking with us now and that makes us happy too. When our harness for our 6 month old Cocker arrives, we may even try to walk to two together. Thank you for aiding the harmony of our household. I am extremely pleased with this dog harness. Today was the best day I've had walking my dog. He tried to run to two other dogs and I was able to stop him. I mentioned he's part Husky and many people said a harness would be a mistake. Thanks a million!!! Ok I love the dog harness!!!! But you knew I would right?? Took him on a hike at Wachusette mountain and he did great no pulling and I felt in total control. Thank you so much. Thank you so much for all your help. I am definitely going to recommend you guys to my big family of dog lovers. Thank you again very much! You have me as a customer for life. I have 2 rescue dogs now and can’t wait to complete my family with just one more in the next year or so. You were so helpful with my order that I just had to send you the heartwarming results. I ordered and quickly received the (smaller size) dog harness and the shorter leash for my daughter's little blind Pekingese. She said the difference in his walks is astonishing. She has better control and he is more confident and bumping into fewer obstacles. He's been such a good little soldier. I thought you would like to hear such a happy outcome. Thank you for your generosity and quick response. Your customer service is one of the best I have ever had the pleasure of working with. I will strongly recommend your products. Well I have to say this dog harness has made a huge difference with our 3 puppies. They still pull a little in the beginning of the walk, but stop much quicker than before. I have one that would pull the 1st 20-30 minutes, she now stops after about 5 mins and it makes walking so much better. Thank you, great product and support. Thought I’d “put in writing”; Your dog harness is AWESOME! MAX is happy, my son is happy and BOY AM I HAPPY! I so appreciate your product. My dog is almost ten years old. We have been through multiple training sessions, tried all kinds of non-pull dog harnesses, watched a lot of training videos and tried to apply what we have learned from them, but she still pulls very hard. Indeed she is an excitable, passionate dog. I love her very much but it is not fun to walk with her. I used to walk her every day but due to all the pulling, my wrists and shoulders are injured. Now my husband has to hold the leash and I walk beside them. I taught her all kinds of tricks and with treat as a motivator, she performs pretty well except she has never learned to walk nicely. I will look for Puppy Perfect book you mentioned and read with my family. When she gets excited no treat or toy can distract her from what excited her and we lose control... we lived with her for nine years and she's gotten better but walking with her is still quite an ordeal. Just wanted to thank you for your care and advice. I want to let you know the smaller dog harness you sent is perfect and Chase is enjoying his walks wearing it. Also, I agree that the Walk Your Dog With Love is sooo much better than the one I used to use before with the attachment on his neck as well as below. Thank You for your wonderful return policy! 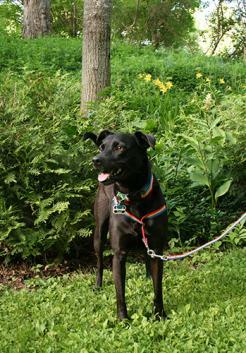 Ryker has been trying out her new dog harness by Walk Your Dog With Love! When I first put the harness on Ryker, I just let her walk freely without giving her any commands. I was very surprised that she immediately let up when she started to pull! The leash doesn't attach to the back like a traditional harness, so her natural instinct to pull isn't triggered! I also noticed that she was naturally going in the direction I wanted her to go in as we walked. Because I lead her from the front, it gives me control on what direction she goes. Once you learn how to properly fit the harness, it is extremely easy to put on and off. You simply put it over your dogs head and latch it underneath the belly. Because the leash attaches in the front, there is no risk of me choking Ryker when she pulls. Ryker doesn't mind wearing this harness at all! I highly recommend this harness for those of you who want to better control your dog, while creating a comfortable walk for both of you! Just received harnesses for my two beagles. Watched the video and adjusted just right. Went around the block and for the FIRST TIME IN 4 YEARS, it was enjoyable. Loose leash, no choking, my arms are the same length as when we started! THANKS FOR AN AWESOME PRODUCT SOURCED AND MADE IN THE USA!! Just got my dog harness yesterday. Unbelievable!!! It's a joy to walk my dog now. No Pulling! I didn’t hold out much hope, but thought I’d give it a try after seeing your website. All I can say is thanks. It really works, two Siberian huskies walking properly on the lead. On the whole the result is miraculous. You’ve got a great product. Absolute best harness for walking your dogs. 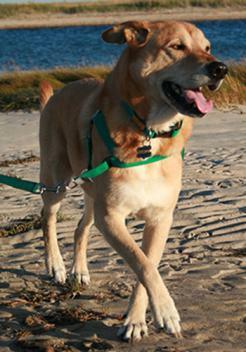 I walk my two 50 lb dogs daily on a double leash each in a Walk Your Dog With Love dog harness. It's easy for me as they do not pull and great for them since they are never choked. It was not possible to walk them before without both things happening. These days we are enjoying peaceful nightly walks. Thank you! Hello, I just wanted to say how satisfied and happy I am with your harness! I have a 1 year old male German Shepherd that made it so difficult and painful to walk. I used the harness today and no pulling!! Your product is amazing! Thank you! Just bought a second harness because the first one made such a difference in walking my boxer. No more straining, coughing, and lunging. Thank you! Getting ready to order my second harness. What a difference this made on my lab puppy. But now I need a bigger size. Great product. I have a 4 year old LabraDoodle, medium sized, who always pulled when I took him for a walk. I had tried everything and basically had just given up. My 2 year old small LabraDoodle does not pull anymore. The harness is like a miracle. I have a harness for each dog and it has totally changed how I view walking them every day. I also realized how much the pulling had strained my back and now it is a pleasure to walk both dogs. They both love walks so now when I get the harness out they wait patiently for me to put it on. I only wish I had tried the harness a lot sooner!!!! We have tried every type of collar/harness for our poodle mix. He pulled no matter how much money we spent! We got this harness with the lead on the front of the harness. What a difference. He simply does NOT pull. Our walks are relaxing and fun for both of us. He likes it! We love it! Thank you for this simple, brilliant idea! When we got our rescue golden he walked fine on a leash hooked to his collar - until he wanted to meet another dog. Then he would pull so hard he choked himself. We tried another harness but it was bulky and hard to adjust and did not give us the control we needed. 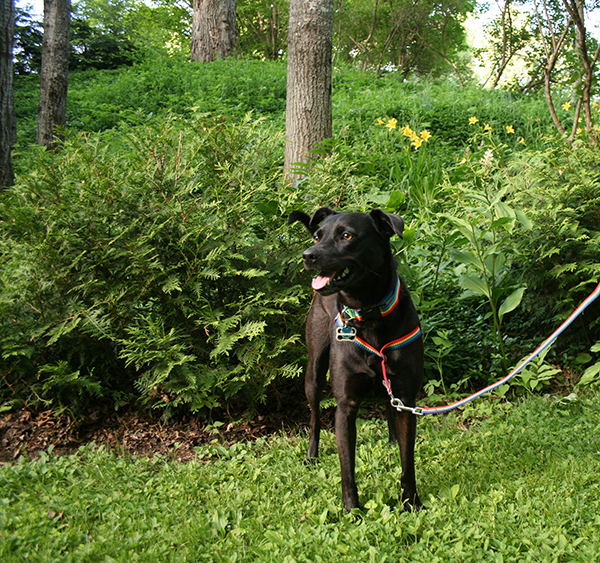 For about the same cost, the Walk Your Dog With Love harness cured the pulling immediately. Plus it is easy to adjust, goes on/off with one click, and looks nice. Thank you! I would recommend this product to anyone with a strong hyperactive dog. I have a young Husky who I am very wary about with harnesses as her strength can usually easily snap them. But this harness has changed my way of thinking when walking her. It has helped me grow a strong relationship with my dog as i now enjoy walking her and dont end up down bankings and up hills!!!! I bought this as a last resort for a friend's 1 year old, 50 lb GoldenDoodle that I frequently walk. Previously I dreaded walking her. After reluctantly buying the harness, I watched the video to put it on her. It was pretty simple. I loved that there was no training process necessary to use it. Now I enjoy walking her and my relationship with my friend has been saved. This harness is really great! It's a great product and I will be buying one for my dog. These products are brilliant, dog friendly, easy to use, light, easy to carry when not in use. I have now got three dog harnesses, two leashes so i can leave a set at My Office.